WASHINGTON — Marine aviator John Glenn, whose 1962 flight as the first U.S. astronaut to orbit the Earth made him an all-American hero and propelled him to a long career in the U.S. Senate, died Thursday. The last survivor of the original Mercury 7 astronauts was 95. Navy Secretary Ray Mabus praised Glenn as "an American hero" and a pioneer of space flight who dedicated his life to his country. "But to those of us in the Navy and Marine Corps family, he will remain a shipmate – a Marine Aviator who flew nearly 150 combat missions in World War II and the Korean War," Mabus said in a statement on Thursday. "His orbit around the Earth inspired a generation, and gave us the confidence needed to meet President John F. Kennedy's challenge to put a man on the moon. "John Glenn's legacy will live on in all the men and women who dedicate their lives to public service and exploring the unknown. The Navy and Marine Corps mourn the passing of a legend, with gratitude for his sacrifices." As a Marine aviator, Glenn was equaled by few and surpassed by none. He received the Distinguished Flying Cross six times for his bravery in World War II, the Korean War, making the first supersonic flight across the US and then for his famous Friendship Seven mission. "We are saddened by the news that one of Marine Corps Aviation's legendary trailblazers and an American hero has passed away," the Marine Corps said in a statement. "Col. John Glenn Jr. led a monumental life from his time serving as a fighter pilot in WWII and the Korean War to becoming the first American to orbit the Earth and fifth person in space. He is an inspiration to us and our fellow Marines. Our deepest condolences go out to the family and friends of Col. Glenn. He will be missed. Semper Fi." In this Feb. 20, 1962, photo made available by NASA, astronaut John Glenn pilots the "Friendship 7" Mercury spacecraft during his historic flight as the first American to orbit the Earth. 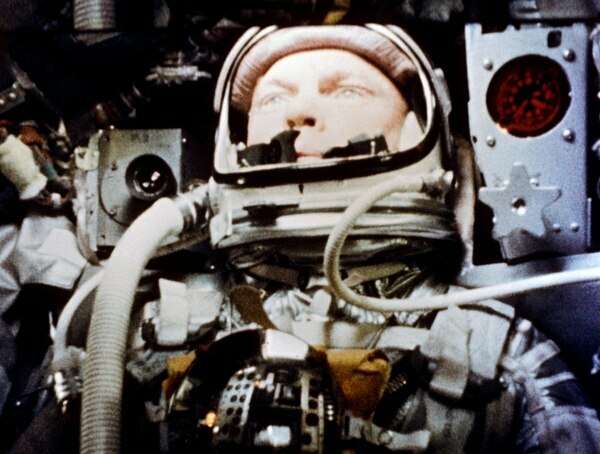 More than anything, John Glenn was the ultimate and uniquely American space hero: a combat veteran with an easy smile, a strong marriage of 70 years and nerves of steel. Schools, a space center and the Columbus, Ohio, airport were named after him. So were children. 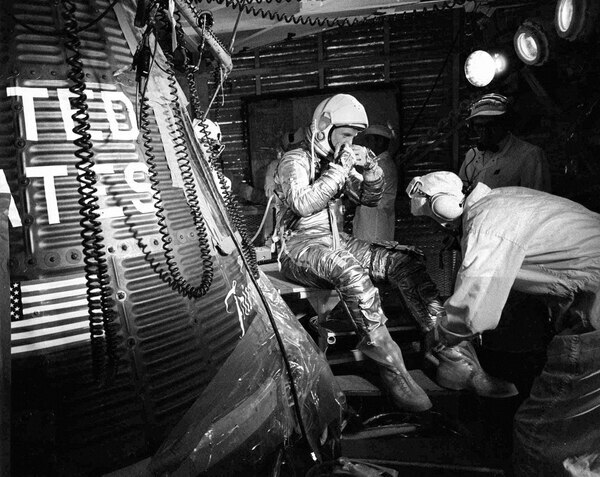 In this Feb. 20, 1962, file photo, astronaut John Glenn sits next to the "Friendship 7" space capsule atop an Atlas rocket at Cape Canaveral, Fla., during preparations for his flight which made him the first American to orbit the Earth. On Thursday, John Glenn, who became the first American to orbit Earth in 1962 and later became the world's oldest astronaut, died at the age of 95. Glenn, who also served four terms as a U.S. Democratic senator, was credited with reviving U.S. pride in its space race against the Soviet Union. His astronaut career, as well as his decorated record as a fighter pilot in World War II and the Korean War, helped propel Glenn to the U.S. Senate back in 1974, where he represented his home state of Ohio for over two decades. Glenn in later years regaled crowds with stories of NASA's testing of would-be astronauts, from psychological tests — come with 20 answers to the open ended question "I am" — to surviving spinning that pushed 16 times normal gravity against his body, popping blood vessels. Glenn's public life began when he broke the transcontinental airspeed record, bursting from Los Angeles to New York City in 3 hours, 23 minutes and 8 seconds. With his Crusader averaging 725 mph, the 1957 flight proved the jet could endure stress when pushed to maximum speeds over long distances. Glenn spent 24 years in the U.S. Senate, representing Ohio longer than any other senator in the state's history. He announced his impending retirement in 1997, 35 years to the day after he became the first American in orbit, saying "there is still no cure for the common birthday." Glenn's returned to space in a long-awaited second flight in 1998 aboard the space shuttle Discovery. He got to move around aboard the shuttle for far longer — nine days compared with just under five hours in 1962 — as well as sleep and experiment with bubbles in weightlessness. In a news conference from space, Glenn said "to look out at this kind of creation out here and not believe in God is to me impossible." 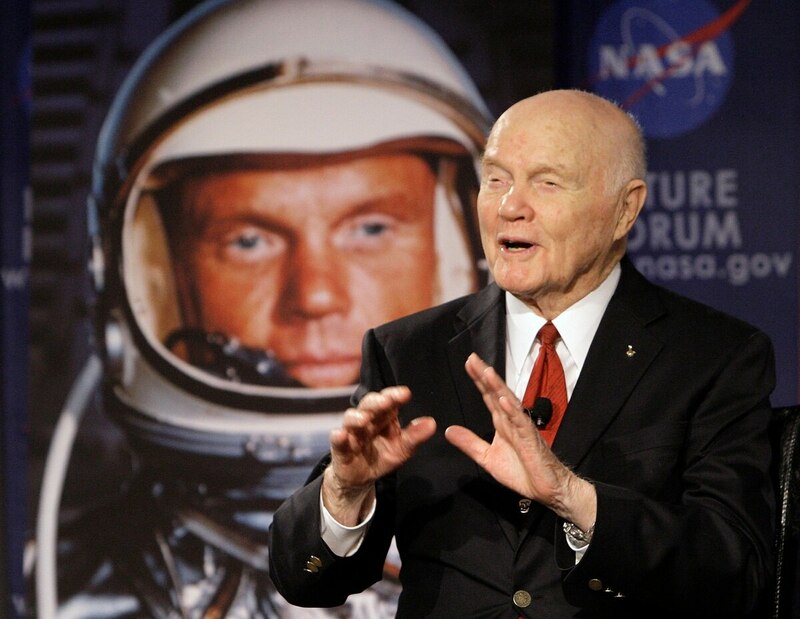 In this Feb. 20, 2012, file photo, U.S. Sen. John Glenn talks with astronauts on the International Space Station via satellite before a discussion titled "Learning from the Past to Innovate for the Future" in Columbus, Ohio. Glenn, who was the first U.S. astronaut to orbit Earth and later spent 24 years representing Ohio in the Senate, has died at 95. He became an expert on nuclear weaponry and was the Senate's most dogged advocate of non-proliferation. He was the leading supporter of the B-1 bomber when many in Congress doubted the need for it. As chairman of the Governmental Affairs Committee, he turned a microscope on waste and fraud in the federal bureaucracy.